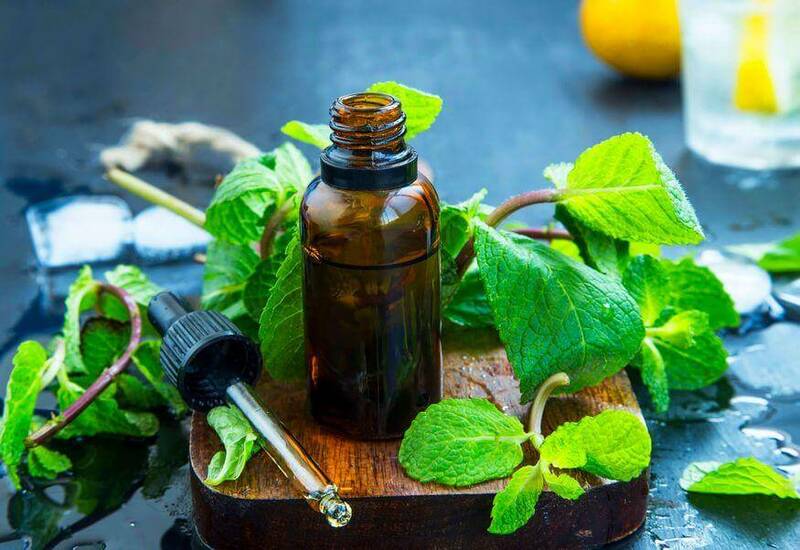 Ayurveda is a 5000 year old system of traditional medicine with an emphasis on prevention and a focus on mind-body synergy to achieve optimal health and wellbeing. According to ayurvedic principles, each individual is born with a specific combination of three life energies called doshas. 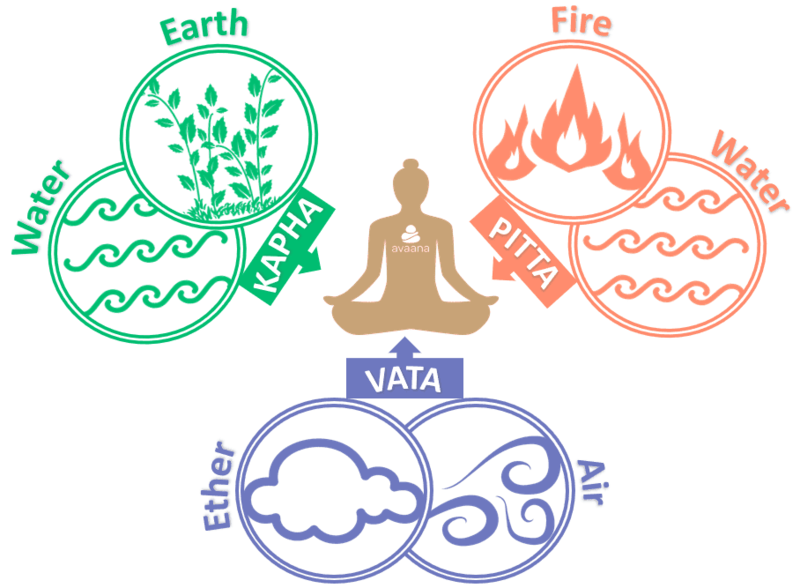 This combination of kapha, vata and pitta doshas determines your physical and mental characteristics and is unique to you. Ayurvedic practitioners refer to your unique constitution as prakruti. When our doshas remain in balance we experience optimal health and wellbeing. However, when there is imbalance (vikruti) we feel out of sorts. 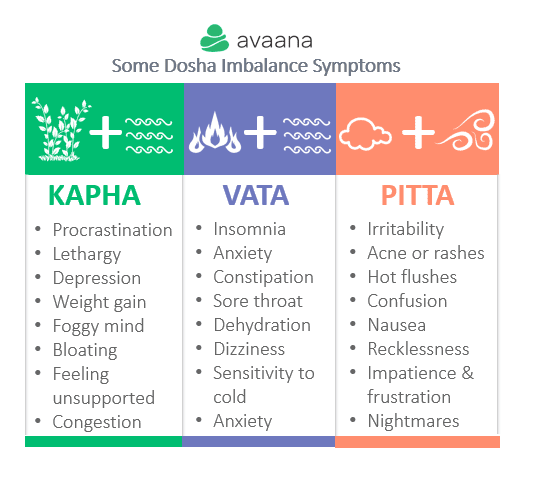 The symptoms or disease you present with when imbalance occurs will depend on which dosha is more dominant to your unique constitution. Ayurvedic practitioners may recommend lifestyle changes or an ayurvedic diet appropriate for your dominant dosha type to rectify this imbalance. 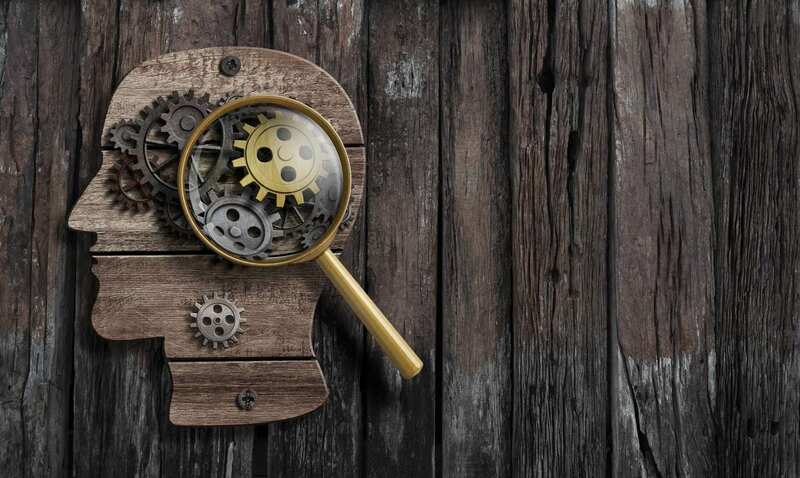 Dosha analysis: what type are you? An ayurvedic practitioner can help you determine your dominant dosha type: search for practitioners near you. Alternatively, take this quick quiz now: take quiz. Kapha types are loyal, grounded, tolerant and forgiving. They are physically and emotionally strong and possess good stamina when they are balanced. However, when imbalance occurs, kapha dominants may present as needy, greedy and insecure. 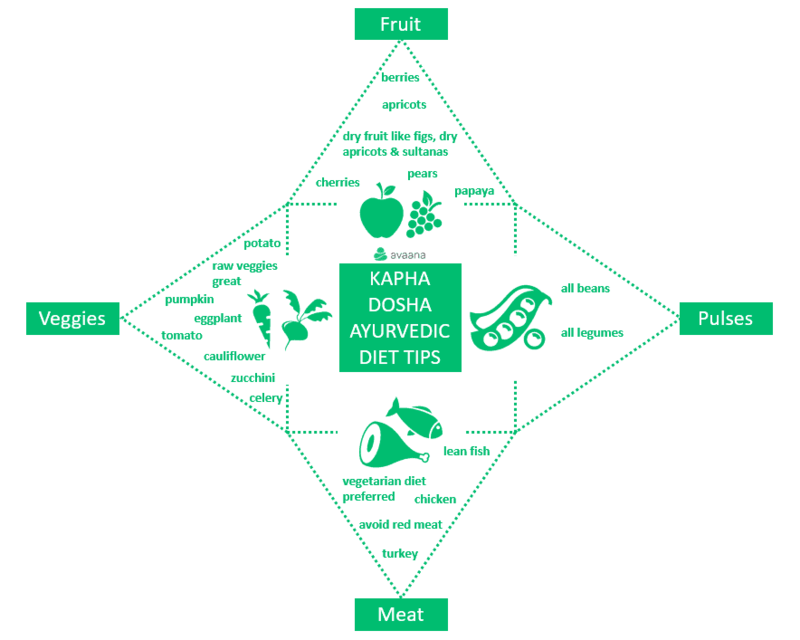 An ideal ayurvedic diet for kaphas consists of warm, light or dry food and lightly cooked meals. Preferred cooking methods include baking, grilling, roasting, stir-frying, steaming and boiling. Fried and fatty food should be avoided. A vegetarian diet suits kapha dominant people well, but limited consumption of chicken, lean fish and turkey is also okay. Kapha dominants should avoid red meat. Additionally, while kaphas may have pulses, they have low protein requirements so don’t need to compensate for reduced meat intake through their beans and legumes consumption. Some kaphas may experience fluid retention. To help manage this, kapha dominant ayurvedic clients are advised to monitor their intake of sugar and fatty foods. People of this dosha type might also find it difficult to digest cold dairy products like ice cream and frozen yoghurt. 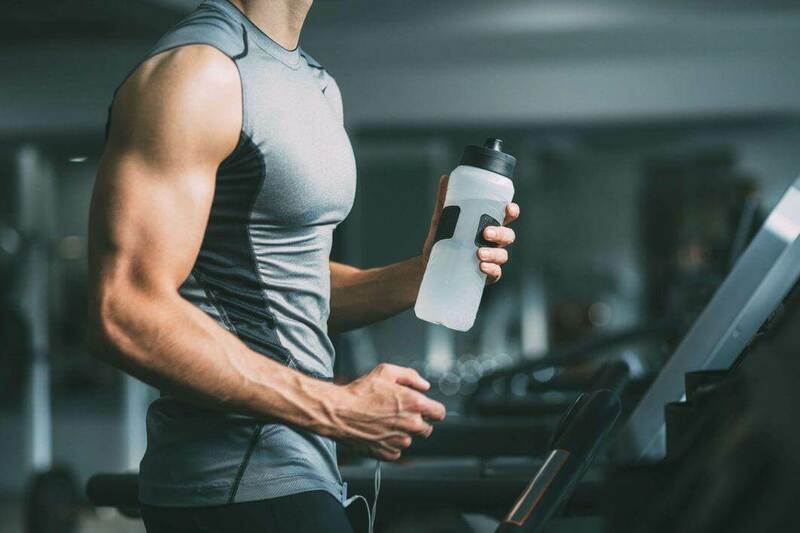 It’s generally best to avoid dairy and cold food or drinks. Herbs and spices are also a kapha’s best friend. Cumin, sesame, garlic and ginger are particularly beneficial and can help improve your digestion. According to the ancient ayurvedic belief system, vatas are charming, quick learners, highly adaptable and creative to their very core. They revel in warmer weather and live a fast-paced lifestyle, which can sometimes leave them quite fatigued as their stamina is limited. 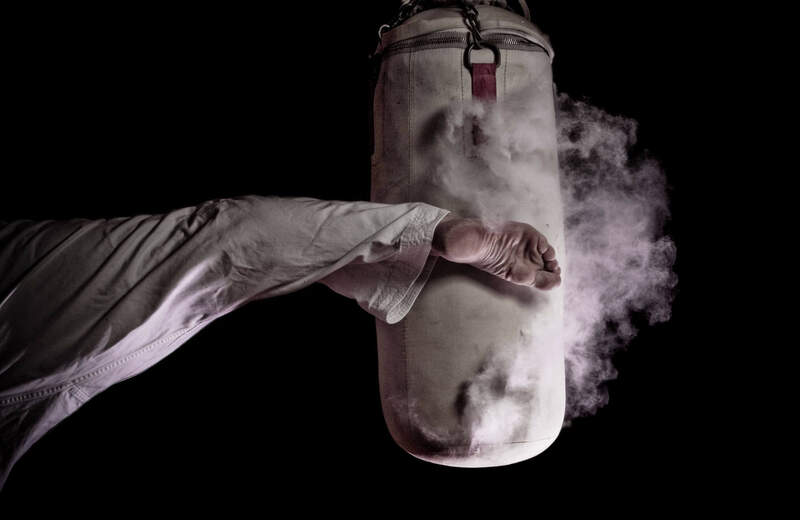 When there is disharmony, vata dominants may present as nervous, anxious and afraid. Vata dominant people have a cold, dry energy, so warm and nourishing foods with heavy textures help keep them balanced. A suitable ayurvedic diet for vata types would be one that favours cooked vegetables and meals over raw options like salads. Similarly, cold or iced beverages are not recommended. Sweet and juicy fruits like bananas, mangoes, apricots and berries are good for vata dominants, as are dairy products and meat. Interestingly, while added butter and good fats can help achieve optimal health and wellbeing for vatas, sugar and caffeine should be avoided. Some herbs and spices like cumin, tumeric, ginger, garlic and saffron are good for a vata-based ayurvedic diets. However, herbs and spices should be used in moderation with bitter herbs or spices like coriander, parsley and thyme avoided where possible. Pitta dominant people are intelligent, charismatic, insightful and generally have good mental acuity. They are considered natural born leaders, but may also be quick tempered. When pitta types experience disharmony they may become irritable, reckless, jealous and impatient. According to ayurveda, either cool or warm food with moderately heavy textures are best for this dosha type. While pittas prefer bitter tasting food and beverages, they should avoid things that are sour, pungent or salty. For example, sweet and bitter fruits like plums and mangoes are encouraged, but sour ones are not. Like their kapha dominant counterparts, pittas should consume a predominantly vegetarian diet. Vegetables can be eaten raw particularly in warmer months, but cooked veggies are also fine. Spinach, asparagus, green beans, green capsicum, Brussels sprouts and carrots are just some of the recommended veggies for pitta types. However, tomatoes, raw onions and chillies are best avoided. 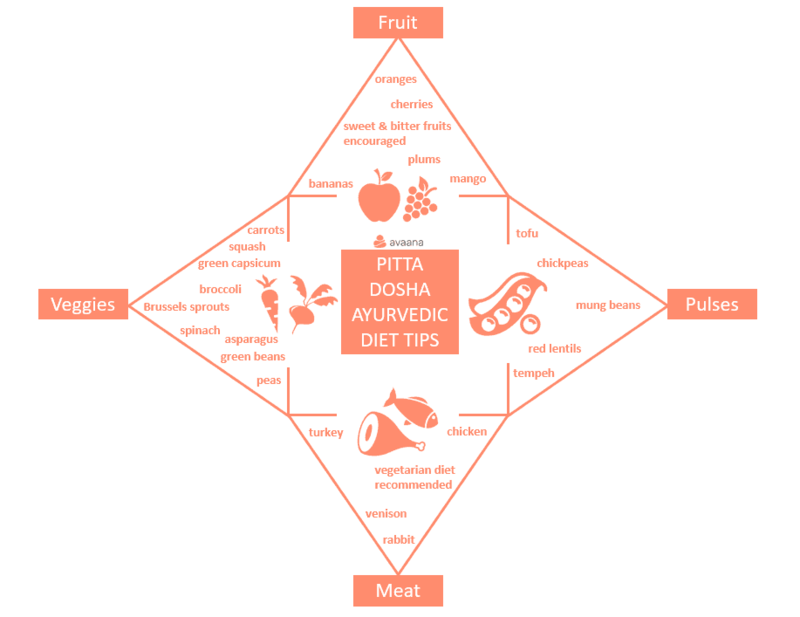 A pitta-friendly ayurvedic diet includes one that is low in added fat, salt, oil and butter. Other restrictions extend to alcohol, fried or fatty food and spicy food. Vatas can incorporate a small amount of green coriander, cinnamon, mint, saffron or turmeric to help enhance the flavour of their meals. 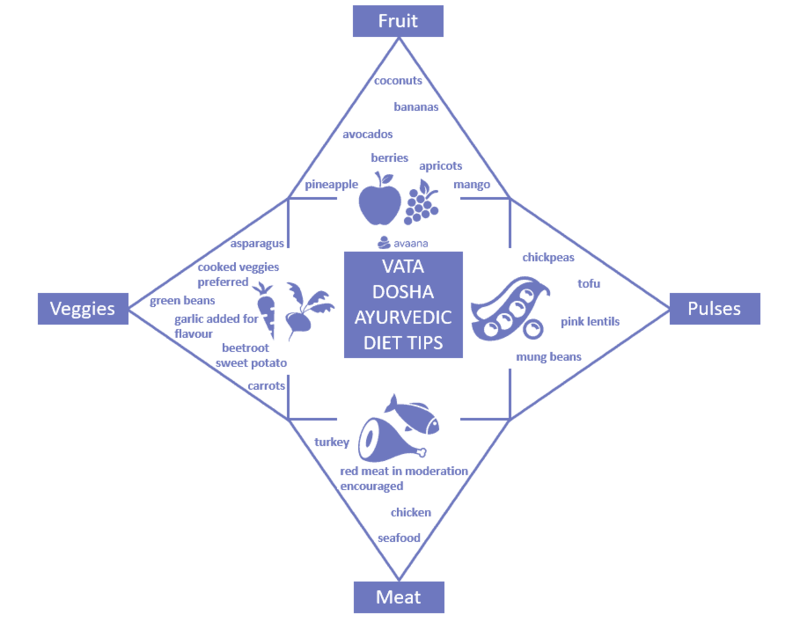 While this post serves as a guide for beginner’s interested in learning about aryuvedic diet and doshas, we recommend consulting an experienced aryuvedic practitioner to learn about your dominant dosha(s) and to receive a customised diet plan. Avaana has some great ayurvedic practitioners to choose from. Click here to get started on your ayurvedic journey!